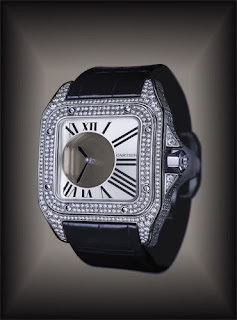 This is indeed an interesting watch from Cartier. 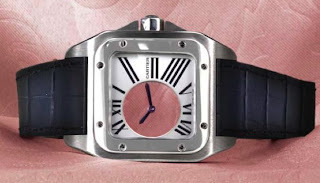 It is the Cartier Santos 100 Mysterieuse Watch. Many knows about this version of the watch. It is made of Palladium and set with round diamonds. As I understand it, about 100 pieces were made and all pieces have been sold. Why Mysterieuse? Well it has to do with the fact that the hour and minute hands appears to 'float' with the watch case. The hands are actually mounted on sapphire crystal discs. What makes this watch unique is that unlike other manufactures of Mysterieuse watch, the mechanical movement is built around the disc, thus making the dial see-thru. Other manufactures (Omega, Vacheron Constantin, Piaget and Montblanc) mount the movement under dial, thus the dial is not see-thru. 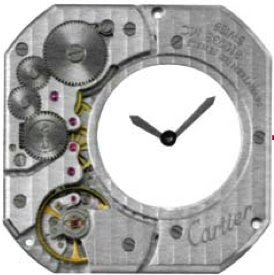 I do know that Quinting builds their movement around the dial as well, but Quinting uses quartz movement. 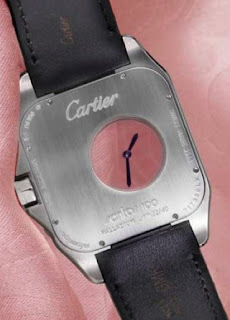 However, last year Cartier launched another 40 pieces. This time, the watches were not adorned with diamonds. Other differences includes the size of the watch. The first watch comes in at 34 X 34 mm. The new non diamond version is 42 X 42 mm. The diamond version is fitted with a hand wound Manufacture 9600 cal. The non diamond version carries the hand wound Manufacture 81003S cal.